The best part about the video is how awkward and confused everyone got and the dad said he thought he was going to sneeze. He then had many people explain to him what dabbing is on twitter. You could tell people there were embarrassed. Okay, I read about this. 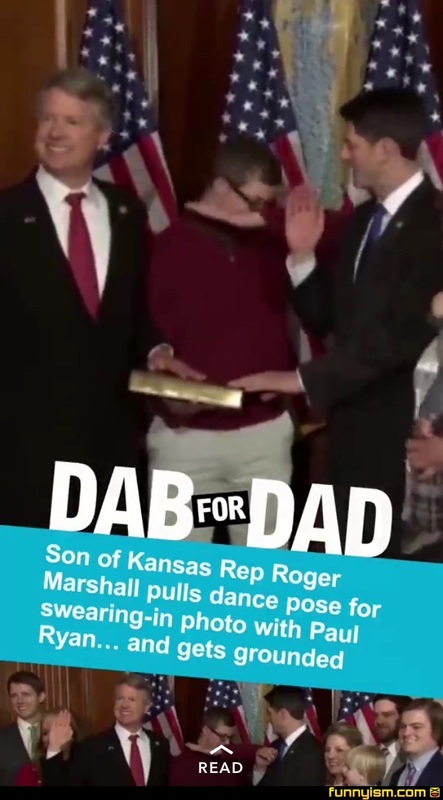 He dabbed and his dad was like "are you okay?" Later his dad found out what he was doing and grounded him. He sent out a tweet saying to Paul Ryan "Don't worry. I grounded him" or something. Then Paul Ryan was really chill about it and said "Don't worry about it. I have children too." That is really not a good time to be the piece of shjt melenial that you are. Some points in life you have to not be socially retarded. That kid needs to be pistol whipped. If I was Paul Ryan I'd use that hand to slap the sh!t out of that fxckboy. Now a meme needs to be made.. Dracula... the original dab... I mean originater of the Vlad. Beause that's what it is called by people who are the OGs. So many wannabes trying to rip off moves and give them dumb names. @Seohn, real fun at parties, are ya? @TamblanTheBrick, I'm a blast because I think of something more original instead of renaming something from a well known vampire movie. I was going to say it looks like he is sneezing. They call that the dab? I call that the Vlad. Fking noobs can't come up with cooler names than dab. Just sounds stupid. At least come up with a move that's original. Posers. Oh by the way. That's how you are suppose to sneeze and cough to properly keep from spreading germs. I feel like slapping people I see cover their mouth with their hand. But I don't because I don't want to catch their sick. @Seohn, That's correct. Mythbusters did an episode on this. I can't stand to see people cover their mouth with their hand when coughing or sneezing. And people wonder why the flu is so bad each year. @Seohn, uhhh... you know what a dab is right? It has nothing to do with trying to prevent germs.